1. Iron Age Man establishes a track along what is now “OLD STREET”. 2. Christian Roman Soldiers worship at the source of the river Walbrook, now St Leonards. 3. Sir John de Soerditch rides against the French Spears alongside The Black Prince. 5. “Barlow” the archer is given the dubious title “Duke of Shoreditch” by Henry VIII. 6. Christopher Marlowe murders the son of a Hog Lane innkeeper, he escapes prosecution. 7. Plague burials take place at “Holywell Mound” by the Priory of St John the Baptist at Holywell. 10. James Burbage’s sons Cuthbert & Richard dismantle “The Theatre” in two to four days & transport it to the South bank of the Thames where it is rebuilt as “The Globe”. 12. Local Huguenot weavers riot for three days protesting against & burning “multi-shuttle looms”. 14. Militia are called from the Tower to quell four thousand Shoreditch locals rioting against cheap Irish labour being used to build the new George Dance tower of St Leonards. 15. Large lumps of masonry fall onto the congregation during a service at the collapsing old St Leonards. 16. The Huguenot speciality “fish & chips” appear at Britain’s first fish & chip shop on Club Row. 17. The many murders & muggings at Holywell Mount lead to it being levelled. 19. 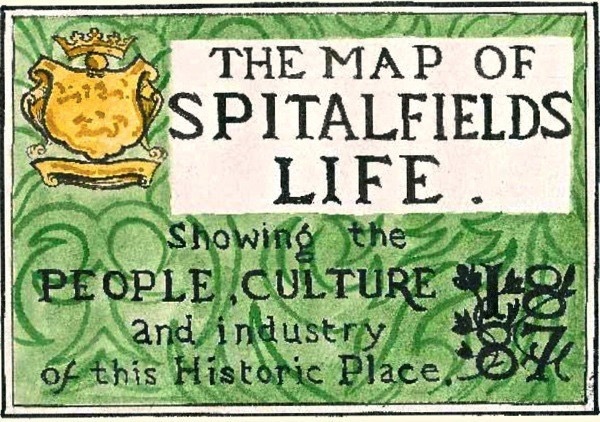 Brick Lane takes its name from local brickfields, occasional location of furtive criminality. 20. Visitors to James Fryer’s land at Friar’s Mount wrongly assume a monastery stood there. 21. Joe Lee, the local horsewhisperer, coaxes improved productivity from working donkeys. 23. 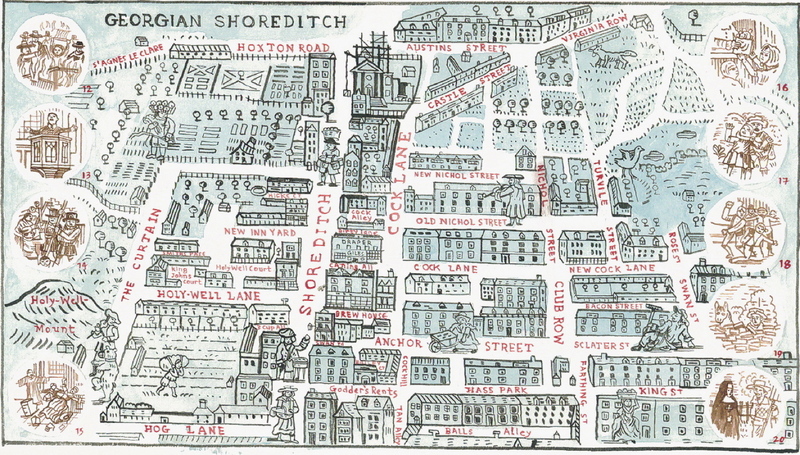 Four thousand people are dispossessed as Bishopsgate Goods Yard replaces streets around Swan Lane & Leg Alley. 24. Mary Kelly’s funeral procession leaves St Leonards amidst huge crowds. The poor victim of Jack the Ripper is given a second funeral at her own catholic cemetery. 25. 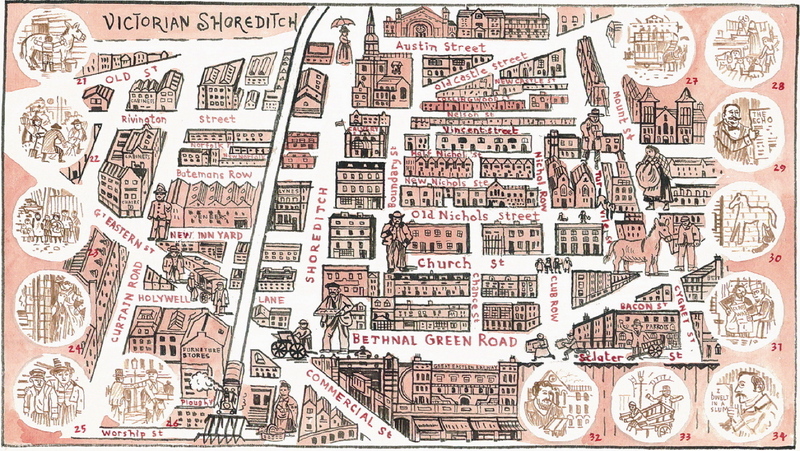 Oliver Twist is said to have resided in Shoreditch. Many other unfortunate children arrive each morning at The White St Child Slave Market seeking work. 26. So many unruly pavement-side street vendors populate Shoreditch High St that a regular uniformed Street Keeper is employed. 27. Horse drawn trams add to the general commotion bustle and smell of the High Street. 28. Cats meat sellers, watercress hawkers & dog breeders all cram into the Old Nichol’s filthy tenements. 29. Sir Arthur Arnold, head of the LCC main drainage committee is commemorated at Arnold Circus. 30. 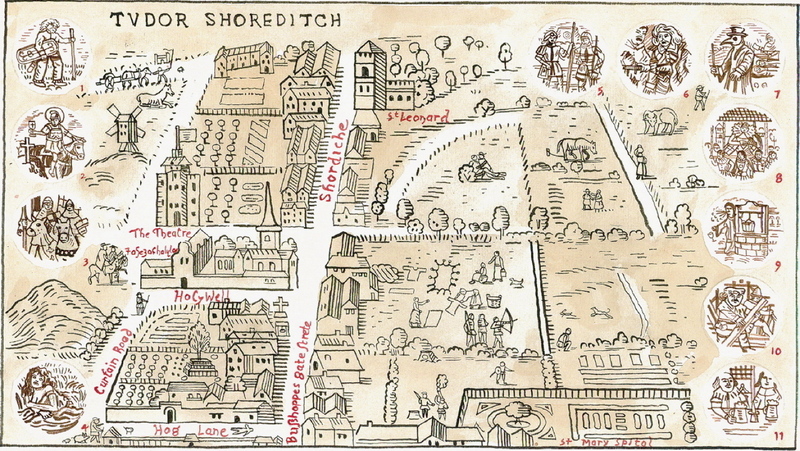 For decades the chalk horse on Bishopsgate Goods Yard is redrawn by unknown local artist. 34. Arthur Morrison pens his slum tale “Child of the Jago” following Reverend Jay’s invitation to the Old Nichol. 35. The chapel dedicated to Shakespeare on Holywell Lane is destroyed by a WWII bomb. 36. Syd’s Coffee Stall, now Hillary Caterers, is saved from destruction during an air raid as two parked buses shelter it from a bomb blast. Thomas Austen’s medieval chancel window is less fortunate. 37. Novelist Arthur Machen identifies a “leyline” running through the mystic ancient earthwork Arnold Circus. 38. King Edward VIII officially inaugurates Boundary Estate from a platform on Navarre St.
39. The Red Arrows pass over the bandstand en-route once more to the Queen’s Birthday. 40. Protestors eventually force the closure of Club Row animal market, once home to dogs, parrots, pigeons and the occasional lion cub. 41. Navarre St is used as a playground by children who carve their names into the brickwork. 43. The resident Bengali flute player of Arnold Circus is often heard across the Boundary Estate on warm Summer evenings. 45. The great train robbers plan their notorious crime upstairs in The Ship & Blue Ball, Boundary St.
46. Jeremiah Rotherham demolishes the Shoreditch Music Hall for another warehouse. 47. Joan Rose‘s father proudly displays his fruit & vegetables on Calvert Avenue whilst she is sent to buy more bags at Gardners Market Sundriesmen. 48. Every type of vacuum cleaner bag is sold by “Zammo from Grange Hill’s dad” at Shoreditch Domestics on Calvert Avenue. 49. The failed Suicide Bus Bomber is seen by security camera leaving the No 26 at Shoreditch. 50. Mono-recording virtuoso, Liam Watson strides past Shoreditch’s “Elvisly Yours” souvenir shop en-route to legendary Toe-rag recording studios in French Place. History’s rich mapestry. Such wonderful detail. I want to know more about the poor girl who drowned in a foul ditch. 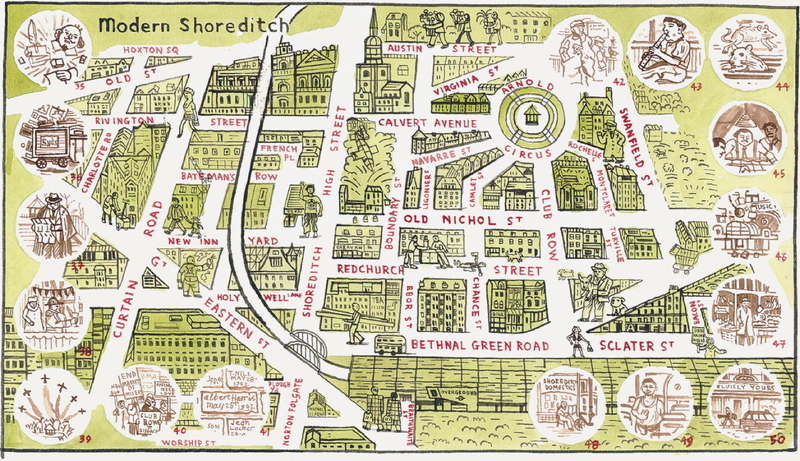 A fantastic quick guide to the history of Shoreditch. My five guineas flying to you via ye olde paypal (much safer than walking it through Shoreditch, from what I’ve seen today). I love these posts and always save them until I have time to read them properly so as to gain full enjoyment. I would just like to query one point in the list above (No 16) regarding Huguenots and Fish and chips. Three years ago, after much research, I wrote a book to raise funds for a local charity and in it I included that the French gave us the idea for chips but that fried fish had been sold by itself in this country for decades before this. I had discovered that it was Angela Burdet-Coutts who had in fact suggested that the two items should be put together and sold as a complete meal – thus the marriage of fish and chips came into being.